A healthy home begins with cleaner air. 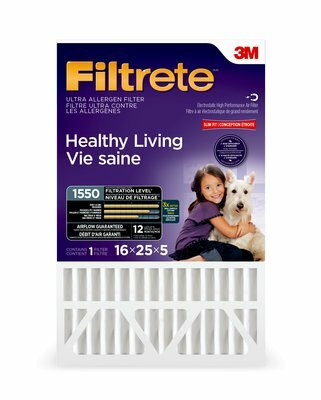 Improve the air quality in your house by reducing the amount of airborne allergens with a Filtrete™ Allergen Reduction Deep Pleated Filter. Using electrostatic technology, this high-performance filter turns your central heating and cooling system into a whole-house air cleaner by attracting and capturing microscopic allergens like pet dander, smoke and household dust, while also taking care of larger airborne allergens such as mould spores and pollen. Designed to fit a five-inch wide furnace bay, the Filtrete™ Allergen Reduction Deep Pleated Filter lasts up to 12 months to ensure you and your household are breathing cleaner air.